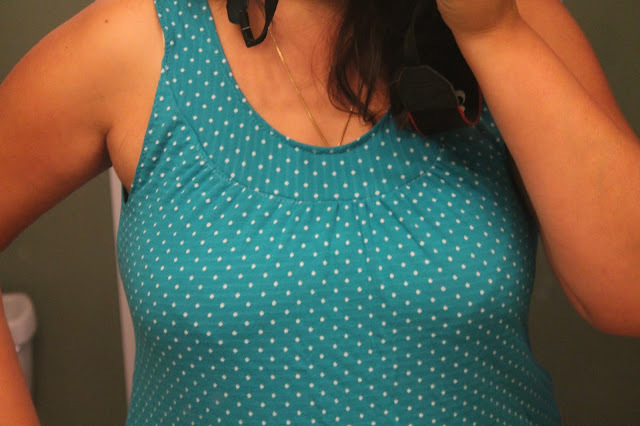 Even though I have four kids and have owned twice as many carriers, I am a dilettante baby wearer. I have always wanted to be one of those smiling moms you see in the photos, doing laundry or housework or running errands, all while a happy baby contentedly relaxes in the Ergo/Moby/mei tai/Beko/whatever. But me wearing a baby never looks like that. The baby is always beet red, screaming and flailing around, desperate to flip him or herself out of confinement. My clothes are always bunched up somewhere, such that I am always flashing some belly flab, back flab, or more cleavage than I'd like. And at least one bra strap is always showing. It is not a pretty sight. When Niko was born I had a mei tai and a Beko (that needs a replacement buckle before I can put the baby in it). I have tried wearing Niko in the mei tai a couple times and all of the above happened. He hates it. I was about to give up on baby wearing. It was too stressful. But then my husband's brother and his family came to visit. During Niko's baptism, my sister-in-law popped my seven-month-old niece into a pretty blue sling. And that little baby sat contentedly on her mother's hip for the entire service. It didn't hurt that both mother and baby are gorgeous. They could totally model ring slings. In any case, I was intrigued, albeit skeptical that this would work for me. As I happened to have an extra 2.5 yards of home dec sateen lying around (due to a Fabric.com order screw-up that at least wound up in my favor), I ordered some rings and got to work. 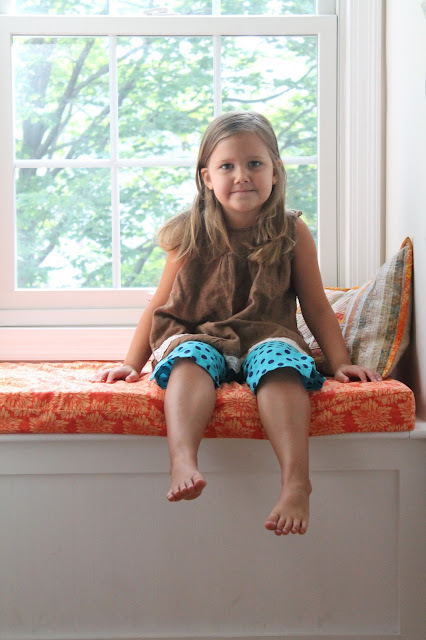 The fabric is the same that I used for an unblogged window seat cushion in our upstairs hallway. My husband built the bench, which opens and stores linens, this past winter. The blue bookrack is a thrift store coup - $4! I am considering painting it, maybe a medium or charcoal gray color. Isn't this the cutest little nook? Essentially, the sling is just a 2.5 yard long, 30" wide piece of fabric hemmed on both long sides and one short side, and then looped over both rings and sewn down on the other short side. I did some pleats on the looped-over part. My rings are not quite big enough for the fabric. I am planning to take it apart and cut 4" or so off the width so that it will be easier to adjust through the rings. I also might take 10" or so inches off the length as it is quite long. It's not as elegant as the slings you buy online - it seems sling makers generally use fabric without a wrong side so that the tail looks like the rest of the sling. My fabric is a print so that doesn't work - but it was free and it was taking up room in my stash so I don't care. Though the length does allow me to twist up the tail and use it as a cushion to support Niko's head, so maybe I'll leave it. The most important bit of information to take away from this, though, is that it worked! He likes the sling! And it wasn't just this photo session; I've worn him in the sling a few other times, for up to an hour at a stretch, and he did not cry! I even think we kind of look like the smug ring sling models in these photos. Though, yes, my bra strap is showing. I guess you can't win 'em all. I snuck in a little sewing time this week but have not finished anything, so I thought I'd take the opportunity to show Niko modeling some of the clothes and diapers I made for him while pregnant. Fitted diapers - Darling Diapers Unlimited pattern, regular newborn size (he's between four and seven weeks in each of these photos). He's a pretty happy baby a lot of the time. Though he does get testy if I don't hold him when he wants to be held. Which is a lot. He does not like my mei tai carrier, but I just ordered rings to make a ring sling in hopes that he will like that better. He developed a nasty case of eczema around 3 weeks old. I stopped eating dairy products and within a month, his eczema had almost completely disappeared. 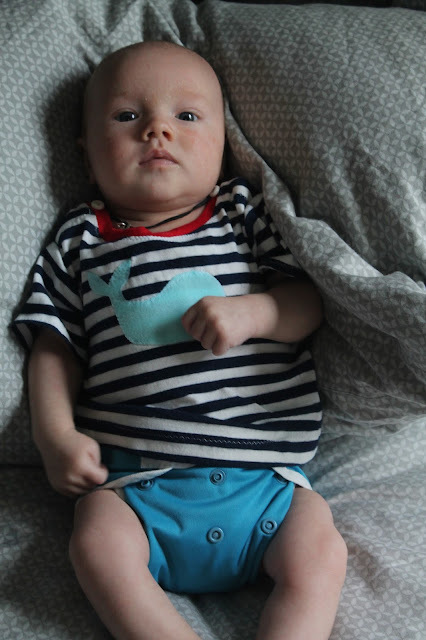 Here he is wearing a fitted diaper with a Simplicity 5316 tshirt. 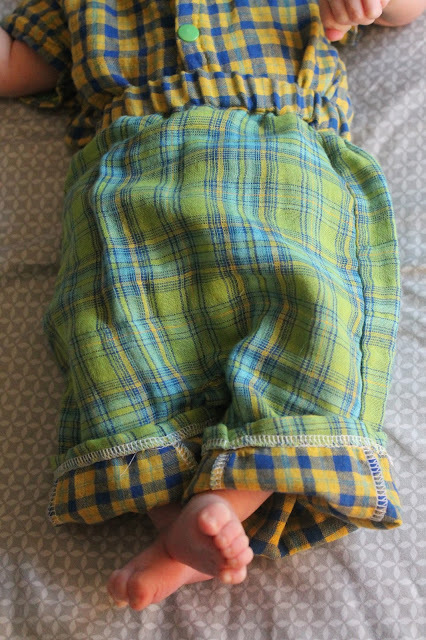 Cute little legs wrapped in covers made using this pattern with my own addition of a second leg gusset, in nb/s size. He is a bit of a nervous baby, maybe because his siblings are always running around screaming. His hands clench into little fists and fly up to the sides of his face. He looks like this a lot. Those fists are clenched so tightly that sometimes I can't even uncurl his fingers. It's just been the two of us in my big king bed the last five weeks, and I feel as though we have really bonded, probably more than I had with any of the others by this age. It's a small silver lining in the cloud of my husband's stroke and subsequent hospitalization. 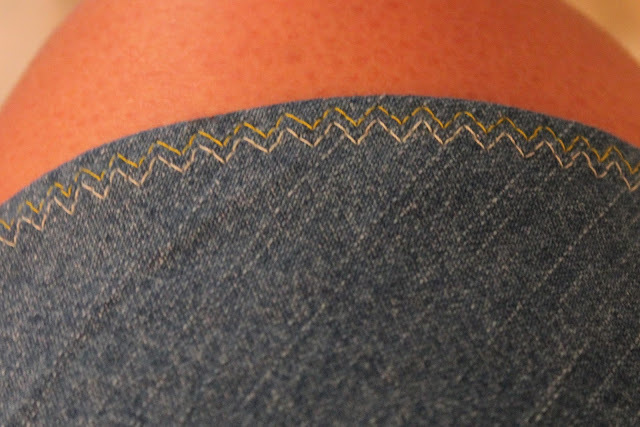 Cute little bottom in pocket diapers using this pattern. He gets a little angry at times. 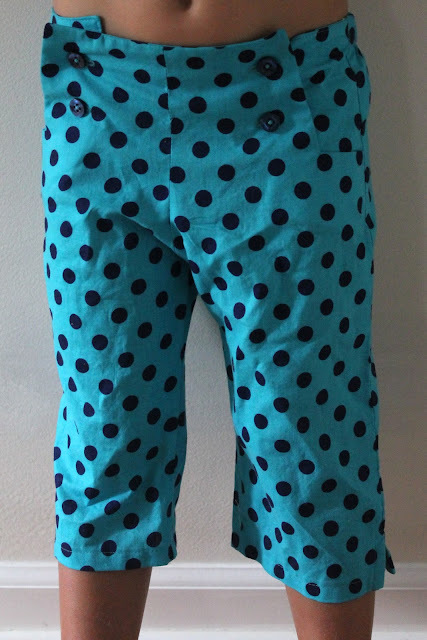 Bodysuit, two pairs of pants and a shirt from the Oliver+S Lullaby Layette pattern. 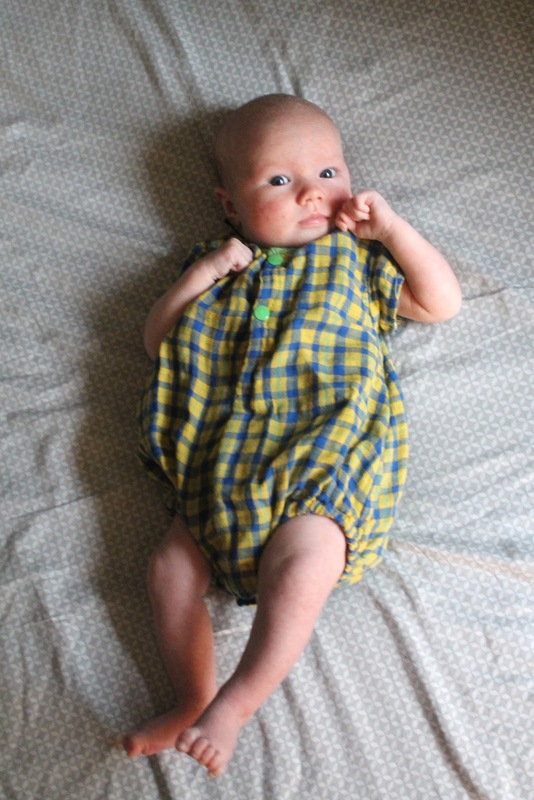 I sewed the 0-3 month size and my little model is 6 weeks old and about 10 pounds (and wearing a cloth diaper) in these photos. That face. He brings me so much joy. Happy baby waiting to see his papa, who is scheduled for discharge from the hospital on Tuesday. We cannot wait to have him home. Apologies for the dreary photos. My usual photographer is still in the hospital and my outdoor timer photos stink. Mirror pics are on the menu until further notice. As I mentioned in my last post, not much fits these days, so I've focused my limited and erratic sewing time on quick pieces for myself. 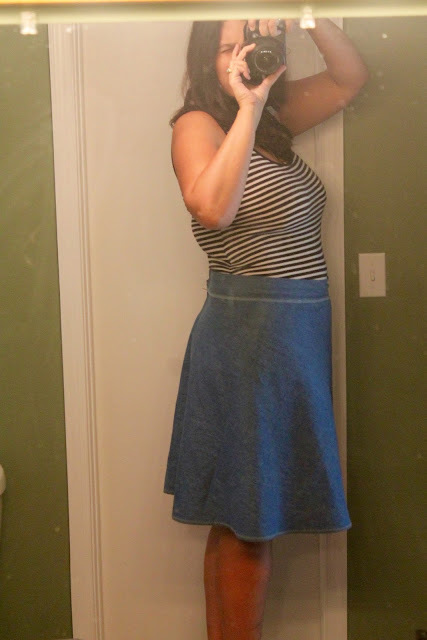 I'd been wanting to try a quarter-circle skirt for ages, ever since I read that it was comparable in fit to my beloved basic a-line skirt. I used the By Hand London calculator to make my pattern. The fabric is a thrift-store denim (2.5 yards for $5 - score!). 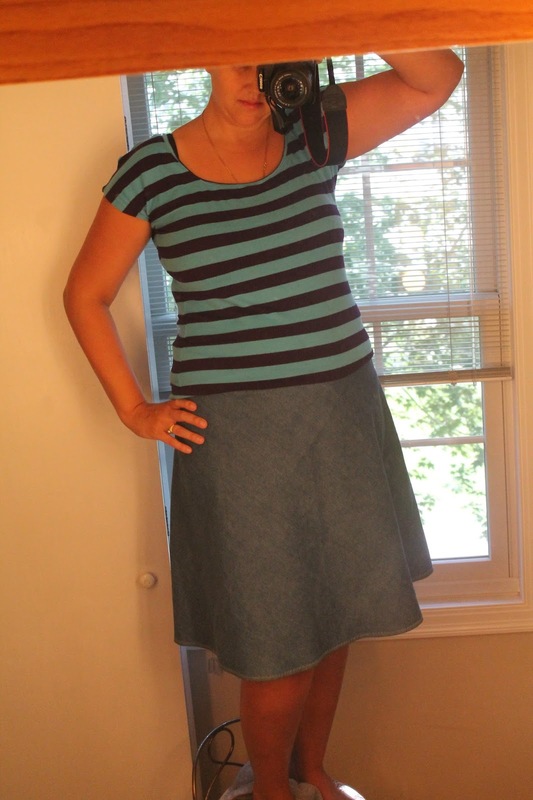 I like the drape of the skirt, but I don't the think the quarter-circle will replace the a-line skirt for me. It's a little voluminous and I feel like it adds weight to my hips and thighs. I suppose it might feel less hippy in a drapier fabric, but I am not sure I will try it. I tucked my shirt in here to show the waistband (which is a little crumpled in front since I did not interface it) but I don't generally tuck my shirts into skirts. 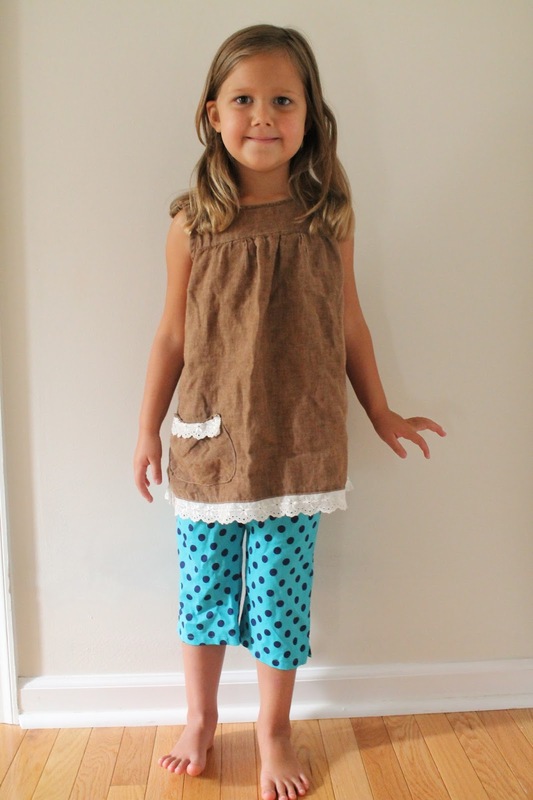 The back of the skirt closes with a zip and a hook-and-eye. I hemmed it with a decorative stitch in two colors. Although my Kirsten Kimono tees are very comfortable, they are a bit tight over the postpartum wobbly bits. 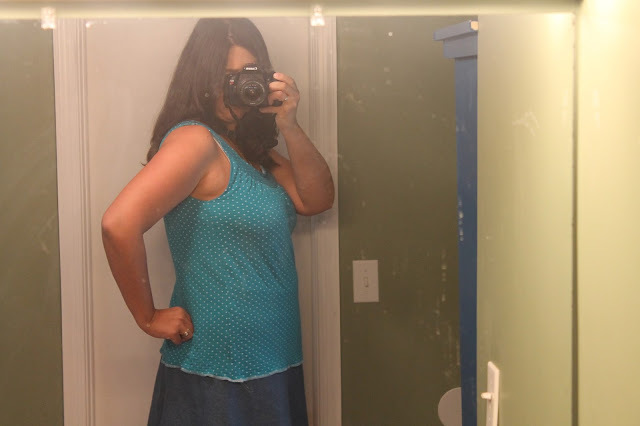 I went searching for a knit tank top pattern with a more forgiving fit, and found the Lady Topas pattern (free!). It features a circular yoke and a softly gathered bodice - a cute alternative to the basic tank top. The pattern is in German, which I do not speak, but it has lots of photos and is pretty easy to figure out. I could not find any reviews of the pattern in English, so I dove in and made the L according to my measurements. It fit very well out of the virtual envelope. 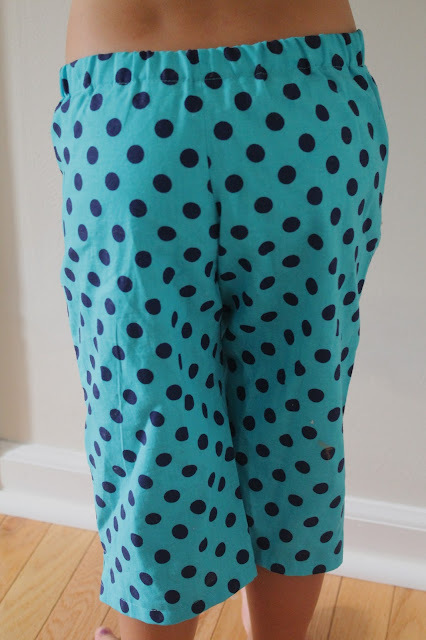 I used a piece of Joann Fabrics reversible rayon/cotton (mostly rayon) knit picked out of the remnant bin a couple of years ago. It has stripes on one side and dots on the other. They have it in a few colors and it is really cute, but it shrinks significantly in the wash. I pre-washed my fabric, but the shrinkage meant that I did not have enough fabric to cut a yoke facing. I was considering this a wearable muslin (and I really wanted to finish it that day) so I decided to make the yoke one layer. I used clear elastic to keep the neckline from stretching out and turned and topstitched it. It works ok but I will definitely make the yoke as written next time. I do really like the fit and the fact that the yoke covers wide bra straps without looking matronly. 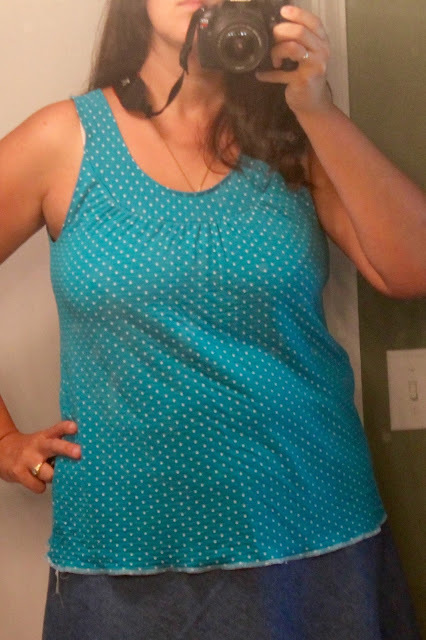 I generally prefer cotton or mostly-cotton knits, but I think drapey fabric is key to the success of this top. I am hoping to find the time to eke out another one or two of these before autumn hits.